Power Wash – The boat will be cleaned from the water line down. There will be an additional charge for materials (acid) and or labor if the boat bottom is found to be excessively fouled. *Power wash is mandated by the insurance company. 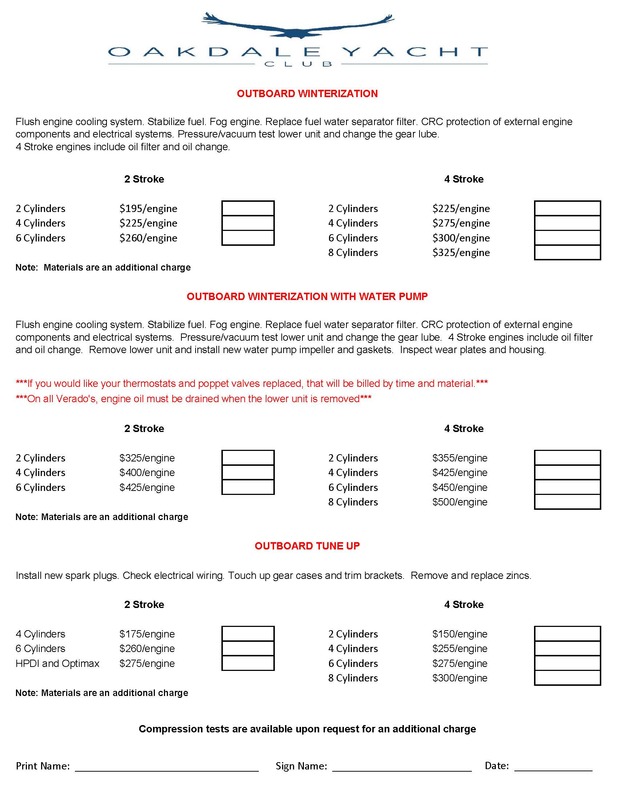 Winterize Engines – *Includes oil and filter change. Any engine that is stored for any extended period of time should have fresh oil to remove all condensation and corrosive elements, which is why we include this in or winterize service. Each engine is fogged with special oil to ensure proper coating of all internal engine parts and non-toxic anti freeze is run through the engines. 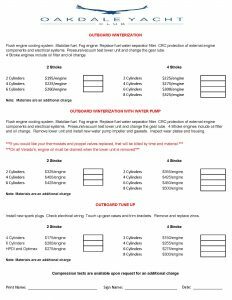 Winterize Generator – Same procedure as winterizing the engine. This also includes oil and filter Changes. 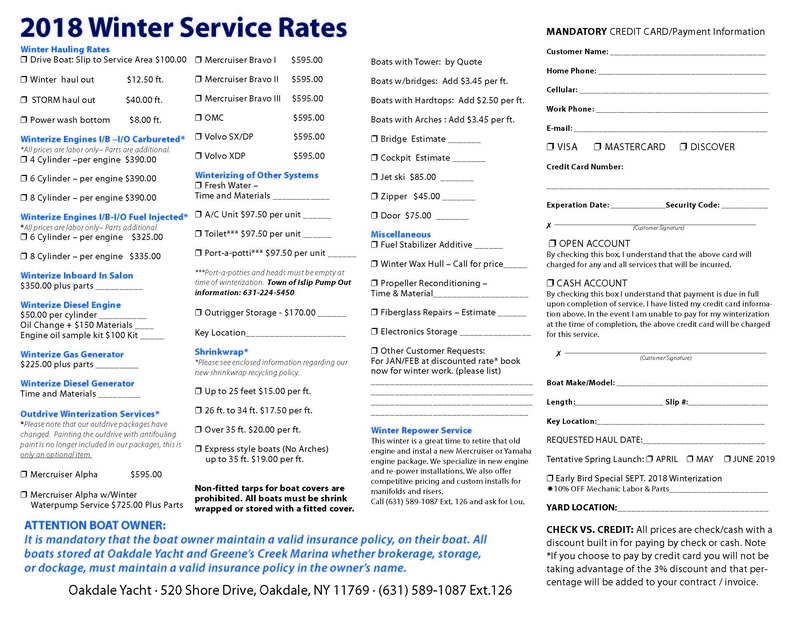 Winterize Outdrive – Includes removal of the drive, inspection of bellows and gibmal bearing, greasing of U-joint assembly, pressure check unit; drain oil to check for any water or other contamination, refill with fresh MerCruiser or appropriate oil, vacuum test until for any leaks, clean, prime, winter storage of outdrive, replace zincs, check engine alignment, install new gasket and o-ring set, and replace drive in spring. Water Pump Replacement – Includes removal and replacement of the water pump in the lower-unti as recommended by MerCruiser. *GREENE’S CREEK MARINA will perform any outdrive work including any checking for damage, inspection of unit, etc. 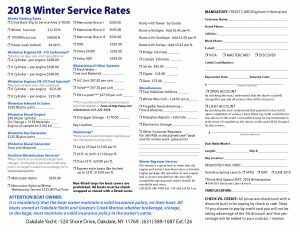 Winterize Fresh Water System – Consists of draining the entire domestic water system, including the hot water tank, blowing the system clean with compressed air or the filling and cycling of a non-toxic antifreeze to ensure that no part of your system will freeze, costing many costly repairs. Winterize Air Conditioning Unit – Includes the draining of the system, including the pump, blowing the system clean with compresses air and pumping antifreeze through the salt water side. Marine Toilet – Each unit must be empty or a service charge will be applied. Includes draining the unit, including any and all pumps, macerators, etc., system is filled with non-toxic anti-freeze and cycled through to ensure all components are protected. Port-A-Potti – Must be empty or a service charge will be applied. System is flushed with compressed air and cycled with a small amount of antifreeze. Battery Storage – Includes removal of the battery at Fall haul out, storage, maintenance, trickle charge system throughout the winter, cleaning of terminals and connections in the boat and replacement of the battery when the boat is launched. Shrink Wrap – Includes all materials plus installation. Provides superior protection against the bad weather, prevents the fading of gelcoat, and reduces the growth of mildew. Shrink Wrap is guaranteed for 6 months. Winter Waxing – Wash and wax hull/deck to protect over winter months. NOTE: All boats are to be removed from the water prior to December 1. Winter Haul Out $12.50 ft.
Power wash bottom $8.00 ft.
*All prices are labor only– Parts are additional. *Please note that our outdrive packages have changed. Painting the outdrive with antifouling paint is no longer included in our packages, this is only an optional item. *Please see enclosed information regarding our new shrinkwrap recycling policy. Up to 25 feet $15.00 per ft.
27 ft. to 34 ft. $17.50 per ft.
Over 35 ft. $20.00 per ft.
Express style boats (No Arches) up to 35 ft. $19.00 per ft. Boats w/bridges: Add $3.45 per ft. Boats with Hardtops: Add $2.50 per ft. Boats with Arches : Add $3.45 per ft.